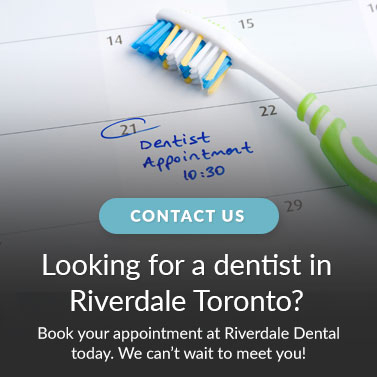 One of the most modern cosmetic treatments we perform at Riverdale Dental in Toronto is laser dentistry for gumline recontouring. Laser dentistry uses short, controlled bursts of light energy that are not detectable by the human nervous system. Lasers allow dentists to carry out otherwise painful cosmetic treatments with much less pain. If your gums rest too low or too high on your teeth and you are unhappy with your smile, you may be a candidate for gum contouring surgery. Also called gum reshaping or tissue sculpting, this cosmetic treatment can even out an uneven gum line and give you a smile you can be proud of. Laser dentistry is very useful in cosmetic treatment such as gumline reshaping. A simple cosmetic gum lift involves surgically contouring the gum tissue to a more aesthetically balanced appearance. Procedures that would normally require anaesthetic, scalpels and sutures can be performed with little trauma and minimal to no bleeding present. This reduces the post-operative swelling and scarring associated with other methods. The gum tissue heals very quickly, and the patient experiences very little, if any, discomfort. The potential for infections is also reduced significantly with laser dentistry. The re-contouring of gums is a relatively simple procedure that can make a great difference in the appearance of your smile. We highly recommend starting an oral hygiene routine for your child early. In fact, general dental care should start at 6 months or when you child's first tooth appears.